The-Gold-20090614, originally uploaded by Paradise in Portugal. It’s not often we get the Gold out here – the last time I can remember was four years ago …. it’s a Family Heirloom, not worth much actually apart from the sentimental value. My Gt Gt Gt Gt something or other got it when he was in London in the late 1700s bailing his son out of prison for some heinous offence and since then we’ve only lost one fork from the whole set so it’s a bit special. Anyway, yesterday evening we just had a lovely American couple from New York for dinner, and as they’re on their Honeymoon we thought we’d give them an evening to remember so served dinner off the Elphinstone plates – another heirloom – and ate with the Gold. A very special time for them and we wish them all the best for the remainder of their time in Portugal – and of course for their marriage! Cork-jars-20090609_4734, originally uploaded by Paradise in Portugal. Cutters-20090609_4728, originally uploaded by Paradise in Portugal. This job can only be done at this time of year as the cork comes away from the tree easier now when the weather is warm. It doesn’t kill the tree taking the cork off; the cork’s removed every 9 years. 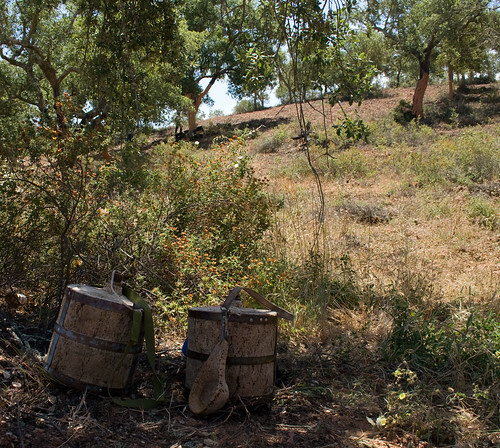 However, the Cork tree is a type of oak and as such is a slow grower – the first worthwhile “crop” is about 45 years after planting – so if this industry dies this rural mainstay will probably be gone for good …. Cutters-20090609_4731, originally uploaded by Paradise in Portugal. 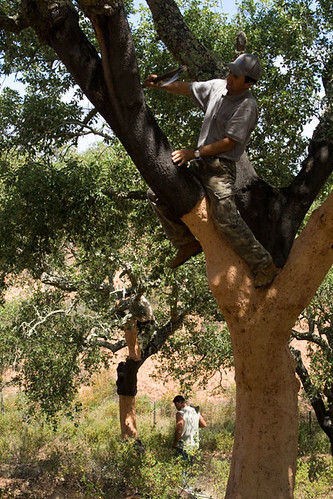 The cork oak trunk or branch is cut laterally twice about two or three feet apart and then longditudinally between the two. 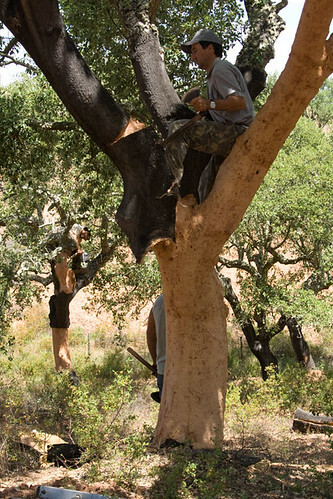 This is done with a very sharp, small “headsman’s axe” and the cutter has to be careful not to cut the phloem layer beneath the cork that sustains the tree. The handle of the axe is then used to pry the bark away from the tree …. Cutters-20090609_4715, originally uploaded by Paradise in Portugal. With the heat of the summer approaching the Cork cutting season is getting under way. 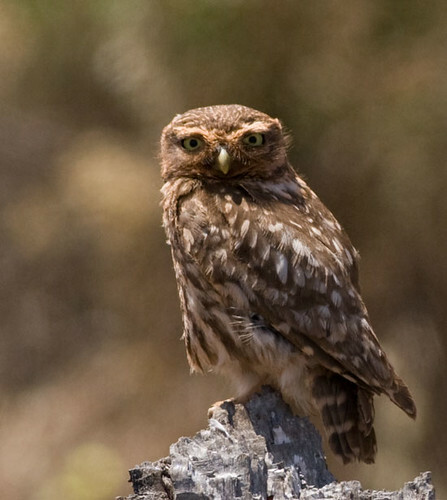 This is a vital economy for our deprived region and as well as providing employment it also sustains the countryside ecologically as well, so it’s imperative we try to keep it going. I’m so passionate about it that I’m going to be giving a lecture about it at the British Bird Fair in Rutland in August – Marquee 2 15.30 on the Sunday if anyone’s visiting. 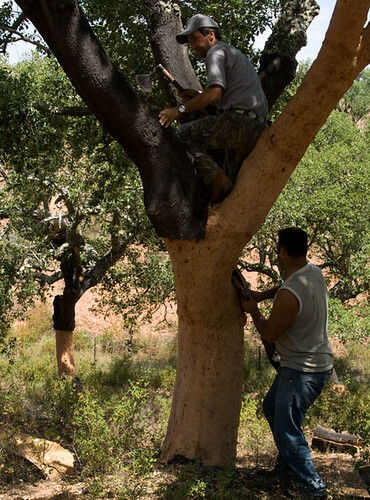 These few pictures show the cork being taken off the trees – a highly skilled, uncomfortable and hard job, especially as the temperature rises through the next few months. Plains-20090609_4677, originally uploaded by Paradise in Portugal. Although up in the hills here we’re still fresh and green, down on the Plains the sun has arrived with a vengeance, the crops are coming in and the over-riding colour is brown ….. this is a view of them I took a couple of days ago on a birding trip. 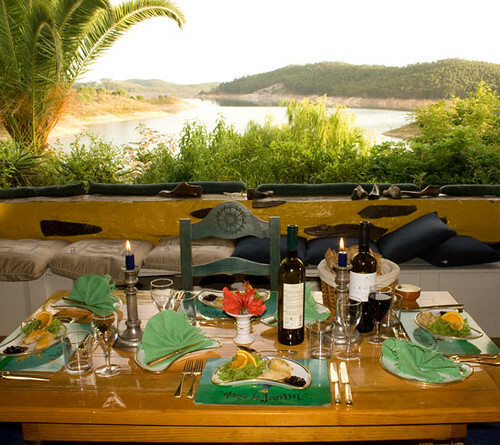 I was born close to the Sahara and this is the kind of countryside that rings my bell just as loud as a sylvan wooded glade …. Special People, originally uploaded by Paradise in Portugal. 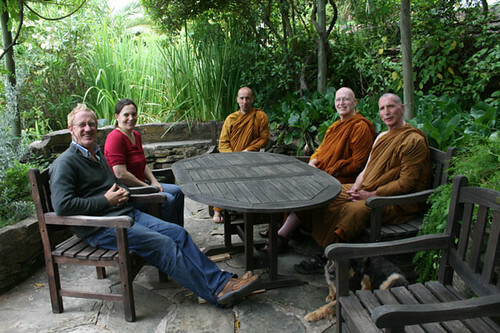 It’s very rare that I put my picture up on this blog and just as rare that we have Buddhist monks come to stay, (in fact it’s a first for both), but we had such a lovely time when these three were here last week that, with special permission, I’m posting this shot to show that it isn’t all birds, wine, weekend breaks and family holidays here at the Quinta; good times, yes, but sometimes there’s an inner peace that can best be gained by silence … Ajahn Sumedho, Tan Subhaddo and Dhammiko were relaxing here before running a 5 day retreat further north and it was a real treat for us to have staying in our home. Heather 20090601, originally uploaded by Paradise in Portugal. Let’s also introduce Heather, our volunteer for these next few months, here measuring the water temperature yesterday morning – it turned out to be a very balmy 24ºC, (75ºF), warm enough for me to go swimming! I came up afterwards to find she’d cleaned and organised the bar, even down to getting the heights of the bottles aligned ….